Finland’s space Nazis are finally here to show us what they are good for. But can the fact that they eat a lot of sauerkraut be a good sign? One of the most anticipated non-Hollywood genre films of the last few years is Iron Sky, a science fiction comedy that has been in development since 2006. Taking the tried and tested sci-fi concept of an alien invasion of Earth and giving it a new spin, Iron Sky brings us Nazis like you have never seen them before! In 2009, Norway’s Dead Snow brought us frozen zombie Nazis. In genre movies, what you often are forced to do today in order to attract attention is mixing otherwise separate genres and concepts, and another (and older) rule of thumb when you want to be creative, is to “go space”. Like Jason Voorhees did in Jason X (2002), and James Bond in Moonraker (1979). Space means bigger, and what can you do with evil German Nazis that hasn’t been done before? Perhaps take them to space? Iron Sky combines genre blending and the space inflation technique to offer an outrageous story, exciting visuals and political satire. The movie starts a few years into the future, when an American spaceship lands on the Moon as part of a presidental re-election campaign. From the lunar landing vessel, a black male model (not an astronaut! ), James Washington, exits onto the Moon surface only to be captured by… Nazis! 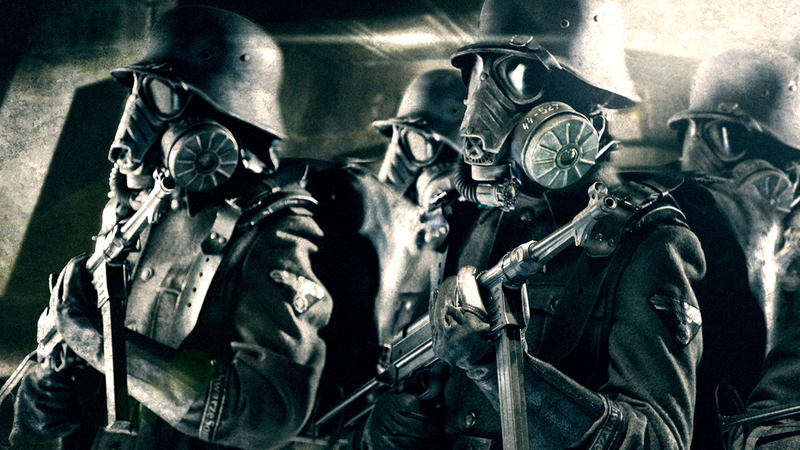 Not aliens of any kind, just good oldfashioned German WW2 Nazis. James is taken to a laboratory and tortured, during which an Einstein-looking Mengele-type doctor realizes that what the Nazi troops needs to invade Earth are lots and lots of smartphones. A primary invasion ensues, preparing the way for the ultimate weapon, the Götterdämmerung. An idea like Iron Sky is simply too good to not be made into a movie. Fortunately, the film was not channeled through Hollywood and remained primarily a European production with basis in Finland, where the main creative forces are based. From the very concept, and luckily all the way through to the finished film, it smells of being a cult favourite, and Iron Sky is indeed the fire that generates smoke. Trailers, artwork and hype make the film justice; is has everything you expect. It also has some extras, like gigantic plot holes you are almost sucked into, but it is very easy to forgive those in order to not waste the film as a whole, a film which is very charming and extremely tongue-in-cheek from the first frame. The typecasted actors, cliché costumes and props, steampunk technology (called Dieselpunk by the director) and Nazi iconography make up a delicious sallad of far-out concepts. Iron Sky makes fun of not only political systems and at least two film genres but also itself; it’s a very self-concious film, and obviously made with an abundance of love. In the same way that a Quentin Tarantino film shows you how big a film nerd Tarantino is, Iron Sky too is a film made by fans, for fans (literally – 10% of the budget was raised by fans from around the world, who bought shares in the film). The biggest problem with the film is, if you expect to laugh from it, that it does not provide absurd amounts of jokes and gags like in a Hot Shots / Naked Gun kinda way; the film doesn’t spray one-liners or slapstick thick across the screen. While those things certainly are present, it’s not a haywire Leslie Nielsen-ish spoof. Political satire, on the other hand, is the premise for the film; just look at all the Sarah Palin jokes, extending all the way to the frames of the American presidental election system and USA’s role in the UN. That may sound boring, but it isn’t, these parodies are as easy to digest as anything else. As far as comedy is concerned, it is layered thick under the surface and if there were Zucker gags every 45 seconds, you would miss the two things that make up 70% of Iron Sky; the appealing images and the political ridicule. The remaining 30% deals with the invasion – except that the invasion and the Moon Nazis are really telling us that even in 2012 we should be aware of dark forces hiding among us, perhaps where we least expect it. The film makes fun of Nazis, but is really talking about something boiling under the lid, and this warning is unfortunately awfully relevant to reality when thinking of the Norwegian mass murderer who in 2011 massacred 69 people (of which 55 were teens) purely to promote his political ideas. The perpetrator was not a disgruntled Islamic extremist or an Arabic terrorist cell like in the September 11th attacks or in countless movies – he was a white, rich, Christian upper middle-class ethnic Norwegian who had his own special political views. Precicely like Adolf Hitler. This comparison is not far fetched, because all good sci-fi stories discuss the society we live in. Attacks from enemies we don’t expect and dirty political campaigns are factual events since long. Add to the mix plenty of references to other films and popular culture, better looking CGI than in Michael Bay movies (not higher quality CGI, but better looking), a powerful Wagner / electronic score by Laibach, and a consistent intentional campy atmosphere, and you have what is certainly one of the best genre entries this year, and not just compared to other Nordic films. Iron Sky confirms why Nordic genre cinema is worth watching, even if you have to search long and wide to find it.